Video games and film go hand in hand often enough. Almost every movie made in the 80’s has some kind of video game tie-in. With ease, you can find plenty of games based on movies. How many games can you find based on hypothetical movies, though? The sequel to The Goonies, the absolutely awesome kids’ adventure movie from the 80’s, is exclusive to the Nintendo Entertainment System. The world may never know why there was no sequel to the actual film or why the United States never saw the original Goonies game, but what they did get is a great, if not somewhat confusing, title to stock their pile with. Much like the original Goonies, the game centers around Mikey Walsh, your asthmatic young adventurer, but this time, it is under different pretenses. All of your friends have been captured by the Fratellis and they aren’t the only ones. A beautiful mermaid named Annie has been captured, too. As Mikey, it’s your job to forge your way from the Fratelli’s broken down old restaurant through volcanoes, snowy caverns, and all sorts of other terrain to save the day. Of course, along the way you find enough power-ups and items to help you through Armageddon and ultimately, a unique platforming experience is to be had. This game has just as many pros as it does cons. On the positive side of things, it’s a great platformer. Not only that, but it has an interesting POV change whenever Mikey enters one of the many doors in the game, shifting to a first person view like Deja Vu or Shadowgate (if you’ve played those, of course). You get a variety of tools, some of which you must get- a hammer to find hidden doors or a diving suit to access underwater levels- and some of which are just benefits- a football helmet will help you deflect falling objects while a candle lights up dark rooms. Finding these items is difficult, but it always feels rewarding. Movement feels smooth, and while the cast of characters doesn’t have much personality, hitting them results in fun and poorly translated responses. On the downside, even with a map, the game can get super confusing. You’ll probably double your play time just by trying to fig ure out where you are and how you got there. There are a lot of warp zones and shortcuts that bounce you to different ends of the map. Also, while finding things is rewarding, the journey to find them can, to put it bluntly, frustrate the hell out of you. Many hints are strewn throughout the game, but in the end, you tend to be on your own. The fluctuation between fun and irritating can be off-putting, but it’s the same with most NES games. It’s been a while since I’ve seen a game with such a difference in music and graphics. As far as the graphics go, they’re not fantastic. The backgrounds are all right, but the sprites are really rudimentary. The first person view tends to be really plain and simple and part of the problem with finding things in rooms is finding the right spot to hit. The only benefit to the graphics is that they’re colorful enough to be attractive to a player. As far as game art, though, this is pretty low end. The music in the game, though, is what stands out. It’s not a big step above games of the time quality wise, but hearing Cyndi Lauper’s ‘Goonies ‘r’ Good Enough’ in an 8-bit arrangement is more than enough. It was hard to get bored with the music since you change areas and viewpoints so often. The sound effects aren’t great, but they are definitely amusing. It may sound terrible, but hitting one of the many characters you find in the rooms always makes me sm irk. Not Konami Man, though. Never hit Konami Man. As an overall package, if you have the patience, this game is great. The ending is rushed, the maneuvering is kind of convoluted, but so far as NES games go, it’s more enjoyable than a lot of them. 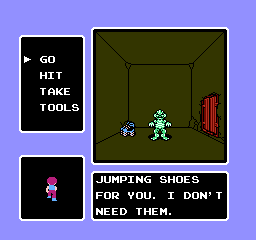 Some of the enemies could were tough given the game, but by the time Mikey is suited up in every accessory you can find, it becomes a fair fight. Thankfully, the game lets you continue as much as you want, and if you want to put it down, there’s a password feature. Not fun passwords, though. Those terrible long ones that you need to write on a full page in a notebook. You also tend to come back in at a place close to where you died, making restarting a pleasure rather than a task. This game has some of the same flaws that games of this time have. In that, I have to say that it does stand up to the test of time, but only so much as the mediocre games of our time. While plenty of people will be put off by the game’s difficulty and base graphics, the same amount of people will enjoy its variety and surface level accessibility. It’s far from perfect, but plenty of NES purists will enjoy this little game and its quirks. After all, ‘It’s fun to play Goonies 2!’.